Ulmus parvifolia "Nire-Keyaki" only 13cm tall from the rim of its pot. I love your elm Nire, in fact i have some also. I would like to see some progress photos. 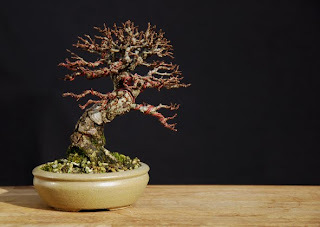 This tree perished along with several other shohin while I was on holiday, a friend was watering, but only once a day, it was not enough durring a heatwave... I was very upset. I now use an automated watering system to prevent such tragic losses.